"...let us try to re-state our initial proposition: criticism sets limitations to the ambiguity of architecture. This means that the historian has to oppose the 'camouflaged anti-historicism' of present architecture. By writing past events into a field of meanings, the historian gives sense to the ambiguity of history: from abstract and completely available the ambiguity is rendered concrete and instrumentalizable. He will refuse to read in late-Antique architecture the premises of Kahn or Wright, in Mannerism those of Expressionism or of the present moment, in the pre-historical remains the premises of organicism and of some abstract experiences. And this refusal is a precise contestation of the mythologies of the pseudo-avant-garde." "The disarticulation of the spatial successions, in the Villa Adriana or in the Piazza Armerina, are so coherent with the premises that justify them--the test of the autonomy range of the single spatial fragment, modulated, contracted or made elastic, to emphasize its absoluteness and to increase its ambiguity within the entire context--as to make these works a sort of anthology, not only for successive studies, but also as sources to draw from: not by chance was a whole number of Perspecta taken up by the Villa Adriana [sic], and Kahn often showed his interest for this singular group of architectural objects. It's not clear why Tafuri considers Hadrian's Villa as an example of late antique architecture, since it was built almost two centuries before what is considered the late antique period. The Piazza Armerina is late antique, even possibly connected to Maximian and Eutropia, and it is quite possible that Tafuri uses the Paizza Armerina as an historiographical link between Hadrian's Villa and Piranesi's Ichnographia Campus Martius. "He [the historian] will refuse to read in [the] architecture [of Hadrian's Villa, the Piazza Armerina, and of Piranesi's Campo Marzio] the premises of Kahn or Wright..."
"Not so in the studies between the laboratories; their problem demanded a more complicated sequence of Form and Design, and its solution was again characteristic of Kahn. Early shapes used were pure derivations from the fanning pattern of the lower peristyle of Domitian's palace on the Palatine or from the "Teatro Marittimo" of Hadrian's Villa. 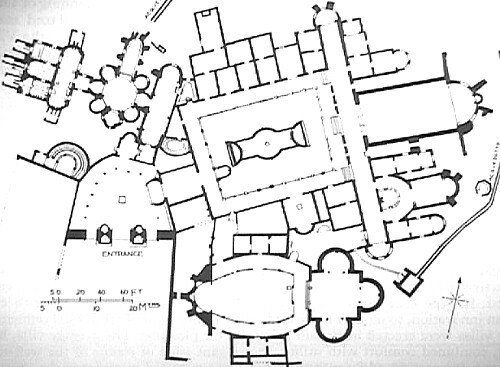 It will be recalled that Wright had long before adapted the plan of the Villa as a whole for his Florida Southern College of 1939, and had used shapes from or related to it in later projects, while Le Corbusier had supplemented his sculptural Hellenic impulses with a series of drawings of the Villa's spaces which culminated in his top-lit megara at Ronchamp. More directly, the shapes used by Kahn can be found not only in Choisy but also infinitely repeated in the composite photostat of Giovanni Battista Piranesi's maps of Rome, drawn by him for his book on the Campus Martius, probably of 1762, which now hangs in front of Kahn's desk. Nervi, too, has used this curvilinear pattern in some of his ribbed slabs. Kahn had intended to support the studies on columns which arose from the associated garden at the lower level to grasp them about at the thirds of their arcs; but a further stage of Design intervened: the scientists could not see the sea from these shapes. Thus they were modified and the present simpler forms grew out of them. I never before imagined the prospect of considering Tafuri's Theories and History of Architecture a deliberate deterritorialization of the Philadelphia School.